In order to attract a large number of audiences, bloggers try to cover way too many topics in one window which does not give them as much coverage as they need. Solution: Define your blog by concentrating on a single area of interest and produce relevant content then. Bloggers write their blog posts like an essay using a full paragraph format in order to deliver maximum information. This only bores the user more who has limited time to skim through your posts. Solution: Keep them engaged with bullets and lists so that you may bring clarity to the content and consequently encourage more engagement. Bloggers can lose motivation easily when they start thinking that they are not reaching the exposure that they need. This leads them to being inconsistent with their content. Solution: Time your posts in advance so that your readers see new content every day. Many writers believe that blogging is a way to vent out personal opinion, rants and feelings. This can be a bad mistake since you are not the only reader of your blog, but you’ve a global audience to engage. Solution: Always offer information for the audience and write for them, not for your own self. A writer might be on the right track but he cannot engage an audience until he uses proper writing skills to impress them. Solution: Use proper grammar and writing skills in order to achieve maximum impact. If you believe that blogging is all about you and you are the only one in the game, you are doing injustice to yourself. Collaboration with other fellow bloggers can certainly do you wonders. Solution: Try to make friends and network with other bloggers so that you can reach a better audience. Bloggers often refuse to take advantage of keywords that could make their blog appear more frequently on search engines and resources. They try to make their posts clever without using keywords. Solution: Pay attention to using keywords to make your post more search-engine optimized. Many people try to impress their readers by using a vocabulary in their blog that is too complex. Their posts could include words that sound jargon and hold no meaning to the reader. Solution: Use easy words that instantly click with the readers and that they understand your message without taking out a dictionary. If a reader wants information on some topic, he is definitely going to get scared from the posts that are too lengthy. He is not going to spend fifteen minutes trying to read 1000 words; he would skip your page. Solution: Keep your posts to a healthy 300-500 words so that you deliver information without wasting the time of the reader. Bloggers believe that information is everything that they need to care about. This approach is wrong since a post is only as effective as its visual impact. Solution: For maximum impact, use relevant images to hit the content home. Skornia Alison works as a social media manager at an online service that offers online college essay help. When she’s not circling or tweeting friends, she loves writing blogs on social media marketing, content strategy development, and more. 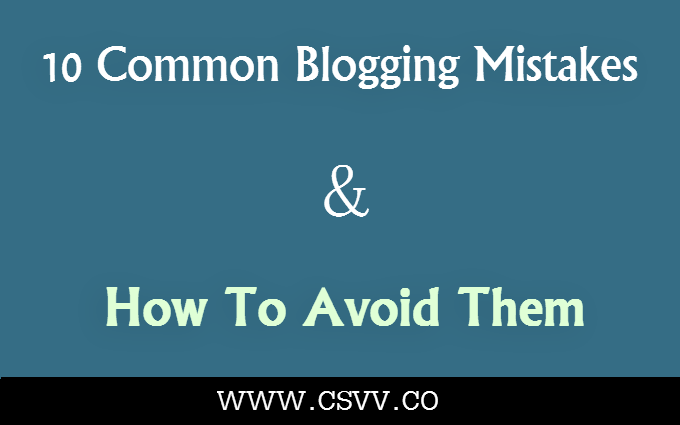 Indeed, these mistakes are prevalent with many bloggers. Its not surprising that where these mistakes abound there is hardly any success. Its a good thing we are reminded of these wrong approaches to blogging. It becomes vital that we take the right steps and correct these mistakes if we want to become successful online! Thank you so much for your comment. Definitely, it takes much work and patience to grow a blog, even if we follow the directions in mention. I think most bloggers grow tired rather quickly, and from here their efforts become that of laziness. Posts like this one reminds us of the tasks ahead, and it can also help many new bloggers.